As strong and as durable as Teak. And, on average, it is more dense. Hardwoods rated as Very Durable, Durable, Moderately Durable or Not Durable. Durability relates to the resistance to fungal decay of a wood species. The ratings are based on the average life span of an untreated 50x50 mm section of heartwood (middle of the log) in exterior ground contact. Hardwoods rated as Extremely Strong, Very Strong, Strong or Weak, based on a measurement in pounds per square inch of the working stresses a wood can tolerate. In general, the greater the density, the greater the exterior resistance, strength and durability. Calculated in kilograms per cubic meter. Tropical hardwoods can exhibit considerable variation around mean density. Eucalyptus Grandis, Flooded gum, Rose gum, is a medium to tall tree with smooth bark, rough at the base fibrous or flaky, grey to grey-brown. Leaves are stalked, lanceolate to broad lanceolate, discolorous, to 15 x 3 cm, glossy dark green. White flowers appear in mid autumn to late winter . E. grandis is found on coastal areas and sub-coastal ranges from Newcastle in New South Wales northwards to west of Daintree in Queensland, mainly on flat land and lower slopes. Flooded gum is an attractive, straight-trunked tree much in demand outside Australia for its timber and fibre. Eucalyptus Grandis is native to the east coast of Australia. Its common name is rose gum or flooded gum (a misnomer). Rose gum is one of the premier forest species in the Australian States of Queensland and New South Wales where it grows 43 to 55 m tall (140 to 180 ft) and 122 to 183 cm (48 to 72 in) in diameter. Its form is excellent with tall, straight, clean holes up to two-thirds of the total height. The bark is thin and deciduous, shedding in strips to expose a smooth surface marked with flowing patterns of silvery white, slaty gray, terra cotta, or light green. Occasionally a "stocking" of light-gray, platelike or fissured bark persists over the basal I to 2 m (3 to 6 ft) on the trunk. Rose gum is one of the most important commercial Eucalyptus, with more than one-half million hectares (1.3 million acres) planted in tropical and subtropical areas on four continents. Massive planting programs have been carried out in the Republic of South Africa and Brazil, and there are substantial plantings in Angola, Argentina, India, Uruguay, Zaire, Zambia, and Zimbabwe. In southwest Florida rose gum may be an emerging commercial species for plantations. It has been successfully tested for pulpwood and fuel; and its wood has potential for poles, pallets, veneer, and other products. In California, Hawaii, and Puerto Rico, rose gum appears in some species trials and landscaping. Over its central range, rose gum grows on alluvial or volcanic loams in valleys and flats within 160 krn (100 mi) of the coast, straddling the Queensland-New South Wales border from latitude 26 to 33° S. Two outlier populations extend the range to the Atherton Tablelands at latitude 13° S.
In Florida, intensive research on rose gum began in 1961 and operational planting in 1972. Through the 1980 planting season, it was commercially planted on 5,650 ha (14,000 acres) in Glades, Hendry, and Charlotte Counties in southwest Florida between latitude 26° 31' and 27° 02' N. and between longitude 81° 31' and 81° 48' W. Outside that zone there are numerous potential planting areas in south Florida. The climate in the Australian native range of rose gum is humid subtropical with mean minimum temperatures during the coldest month ranging from 2 to 10° C (36 to 50° F) and mean maximums near 29° C (85° F) during the hottest month. Rainfall averages 1020 to 1780 mm (40 to 70 in); it is concentrated in the summer, but monthly precipitation during the dry season is at least 20 mm (0.8 in) (10,21). Coastal areas are generally frost-free, but higher altitude, inland areas experience occasional frosts. Southwest Florida is humid and subtropical. Summers are long, rainy, and warm; winters are dry and mild but with the threat of damaging frost. Mean annual rainfall ranges from 1270 to 1400 mm (50 to 55 in). Monthly precipitation during the rainy season, June through September, averages about 180 to 200 mm (7 to 8 in). Rainfall during the dry season, November through April or May, averages 50 mm (2 in) per month. Dry-season rainfall is unreliable, however. Daily maximum temperatures from late May through September exceed 32° C (90° F) on most days but rarely reach 38° C (100° F). During the coldest month, daily maximum temperatures average near 24° C (75° F) and daily minimums near 11° C (52° F)). But swift continental cold fronts change balmy afternoons into dangerously cold nights. The lowest temperatures recorded in each of 30 winters averaged -4.4° C (24° F). This species grows on flats or lower slopes of deep, fertile valleys in Queensland and New South Wales. It grows best on moist, well drained, deep, loamy soils of alluvial or volcanic origin. Clayey soils are acceptable if they are well drained. The rose gum plantations in Florida lie in a physiographic region known as the Western Flatlands. Topography is nearly flat; elevations change almost imperceptibly from coastal sea level to 6, 12, or rarely 18 m (20 to 60 ft) elevation inland. Soils are almost exclusively members of the sandy, siliceous hyperthermic Haplaquods. Derived from marine deposits, these soils are mainly sands, strongly acid, poorly drained, and underlain by spodic horizons that are commonly impervious to root penetration and water drainage. The combination of high seasonal rainfall, flat topography, and low elevation results in high water tables, shallow root zones, and local inundation during the rainy season. Conversely, during the dry season these sandy soils rapidly become moisture deficient. 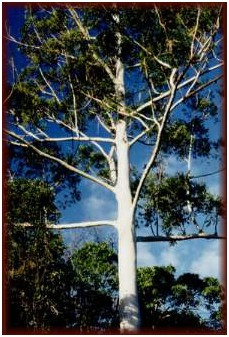 In its native range, rose gum grows in tall, open forests associated with the eucalypts E. intermedia, E. pilularis, E. microcorys, E. resinifera, and E. saligna, as well as Syncarpia glomulifera, Tristania conferta, and Casuarina torulosa. Rose gum also commonly grows on the fringes of and occasionally within rainforest. In Florida, rose gum plantations are most frequently established on palmetto prairies. The characteristic vegetation of palmetto prairies consists of a ground cover of Serenoa repens, Aristida stricta, Andropogon spp., Myrica pusilla, M. cerifera, Ilex glabra, and Quercus minima, with the scattered trees, Sabal palmetto, Quercus virginiana, and Pinus palustris). Copyright © 2001-2019 Teak Patio Furniture SalesAll rights reserved.